So I took a moment to lie to myself errr… justify my monthly payment to Blizzard for the privilege of logging into World of Warcraft. The launcher opened up, and to my surprise, there’s an add for Cosmetic Head Gear that you can BUY NOW! No, you’ve got to be kidding me, I think. Curiosity wins, and I click the link. Put a hat on your toon for the price you pay to play the game for a whole month! WHAT A BARGAIN! I know the Free-to-Play slash Free-to-Pay model is sweeping the medium, but Blizz, here’s a bit of advice. The trick with that model is the term microtransactions. Charge $1.99 for an app, or 99 cents for something cool, and people will pay without thinking too much. I suppose they have some reason to go this route. They’ve sold unique mounts like celestial steeds, and special pets like mini versions of big bad bosses in the game. Those have ranged from $10 to $25. Nope, that’s way over my head. Candy Crush is the devil. But Angry Birds is a good time… and they keep providing free updates! My son absolutely adores that game. Seems like an attempt by Blizz to somehow capture the popularity of hats in Team Fortress 2. Difference being, hats in TF2 are not just cosmetic, and you don’t actually directly pay for them in most cases. So, yea. I’d say Blizz failed. I’ve seen a couple of these in game… but not many. Blizz seems to have had more success with various special mounts. I just don’t know what to make of these “microtransactions”. CCP did this in EVE Online too, with a monocle – you know, a simple eye piece – that updated onto your in game user pic, and it cost three month’s subscription fee, about $45. This is SPARTA!!!!! Or words to that effect. Wow, $45 is ridiculous! 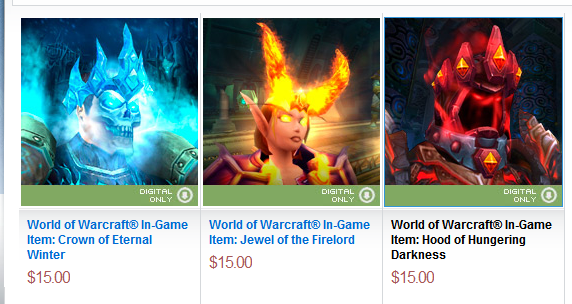 I thought Blizz was bad with the $15 fee. It’s a brave new world of gaming, I suppose.